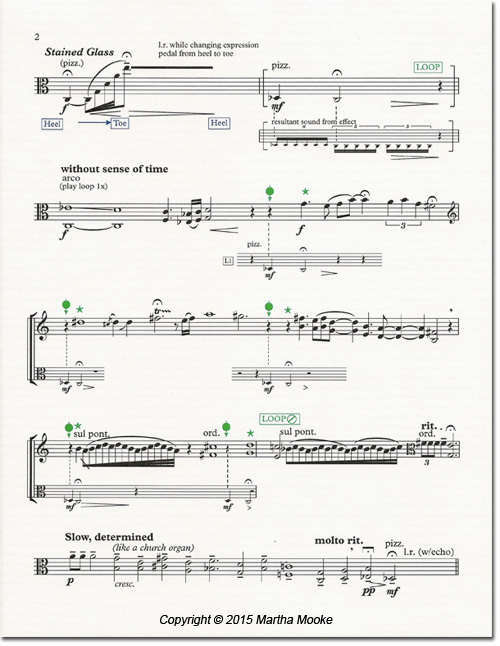 The score contains Program notes that explain how I use the effects processing and how I had to create a new method of notation so that others can eventually perform the work. There is also a page that contains screen shots of the Effects settings that I’ve personalized. 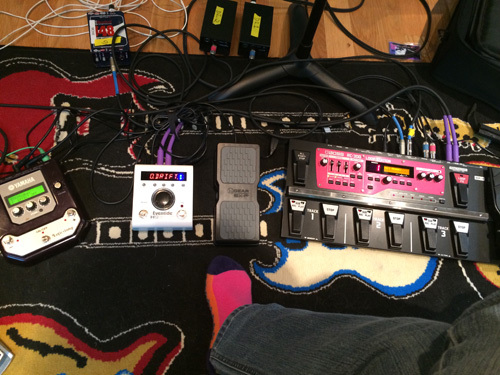 These include positions of the expression pedal, allowing for greater control within each effect. For example, the final section of the piece, which I call "Window of Opportunity" utilizes the Shimmer algorithm. The resulting harmonization and rhythm grow out of the single line melody. I also use Resonator, HarModulator and Vintage Delay throughout the piece, and other algorithms throughout the recording. I have also had to create notation to incorporate a dedicated looping device. There are times when I use the loop as a rhythmic ostinato, and there are also times when it’s used to trigger a single event, as indicated in the music notation. Throughout the recording, I use layers to build sonic complexity on top of the original loops. Because of the way I integrate the H9 and other effects processors in my music, it’s become important to create ways of notating the precise settings and, in some instances, the actual resultant sound (i.e., playing one note while using a particular digital delay setting can result in a ping-pong stereo echo effect, or triggering a harmonic progression with a simple melody). The official CD release will be a brunch-time celebration on December 13th at the Cutting Room, NYC. Martha Mooke is a pioneering composer/electro-acoustic violist, in demand as performer, composer and educator. A leading Yamaha and Eventide Artist/clinician, Mooke is Violist/Artistic Director of the Scorchio Quartet, featured on David Bowie’s Heathen CD. She has played with Barbra Streisand, Peter Gabriel, Star Wars in Concert, Philip Glass, Laurie Anderson, Elton John, Trey Anastasio, Lou Reed, Patti Smith and others. Mooke received the prestigious ASCAP Concert Music Award for creating the new music/boundary defying showcase THRU THE WALLS. Her new CD, No Ordinary Window is produced by Grammy® winner Cynthia Daniels.